You will find a lot of confusion about magnetic loop performance, in particular about how they work differently from normal antennas. Let’s dig in. Antennas are transducers. If you check your dictionary, a transducer is any device that converts energy from one form to another. In our case, antennas convert electromagnetic waves into voltages and currents, and vice versa. We have come to think of antennas as two plates that establish an electrical field between them. This is exactly how dipoles and ground plane antennas work. When you transmit, you set up electric field variations in each plate. When you receive, the electric field antenna captures these fields across two plates and converts the signal into voltage. On the other hand, magnetic loop performance is quite different. When EM waves cut the loop, they create a flow of current rather than an electric field. You can read more about these effects in this excellent article. Simply put, large or small, shape matters. You may have noticed the similarity to the concept of capacitors and inductors. 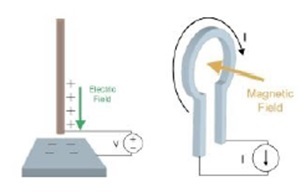 Capacitors manipulate electric fields and loops play with magnetic fields. One of the main differences is that loops have extremely small radiation resistance, and that makes them harder to work with. This is particularly so for design to minimize loss. In general, loops are much less efficient are rarely used for transmitting. On the other hand, electrically small loops are less susceptible to electric field interference – a major source of RFI. This is most true when loops are not grounded, i.e. a balanced configuration. In urban environments, the E field tends to dominate local noise or interference. Add to this the ability to point a sharp null at interference, and you might have a winner. Finally, there would be less confusion if “magnetic loops” were simply called “inductive loops”.